The period initially covered by Arts:Search is 1923. Available soon. 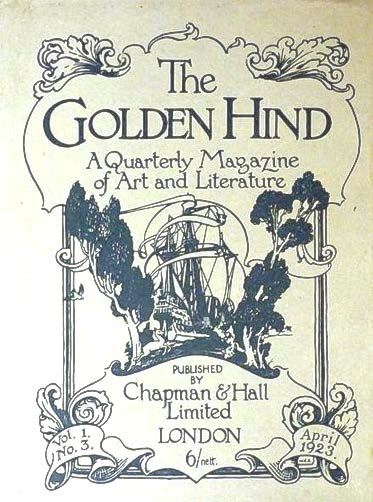 Edited by Clifford Bax (1886-1962) and Austin Osman Spare (1888-1956), The Golden Hind was a short-lived Modernist magazine, published quarterly between October 1922-July 1924. So far only one issue (vol.1, no.3, April 1923) has been digitized. Our intention is to digitize further issues. Literary contributors to this issue included Naomi Michison, Aldous Huxley, George Sheringham, W.H. Davies, Clifford Bax, and Cecil French. Artists whose work is illustrated include Haldane MacFall, Austin O. Spare, Warwick Reynolds, Walter E. Spadbury, E.A. Cox, Cecil French, Louis Bouquet, Laurence Bradshaw, and Grace E. Rogers.